Reduce sugar. Gain consumer loyalty. Everybody loves sweetness. But consumers are moving away from calories that come from sugar, and low- or no-sugar products are in high demand. 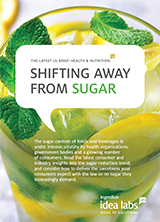 Read our research report to get consumer and industry insights into the sugar reduction trend. Find out how you can create delicious reduced-sugar products consumers will feel good about.